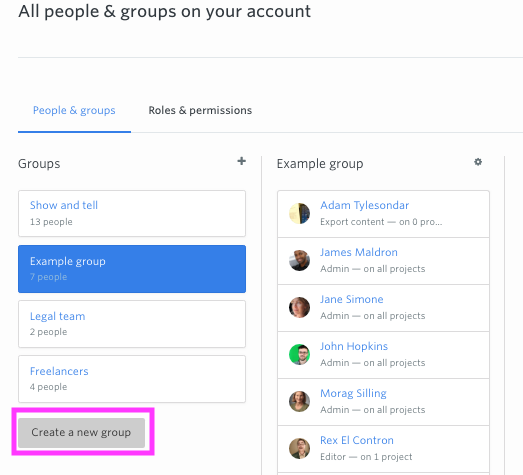 You can organise people into groups in your account. This can be helpful as a means to separate different organisations and teams that use your account. A group might be a client company, an SEO team, a legal or external approval group or different departments within your own company. You should see at least one group here already. You can then choose a name for your group. 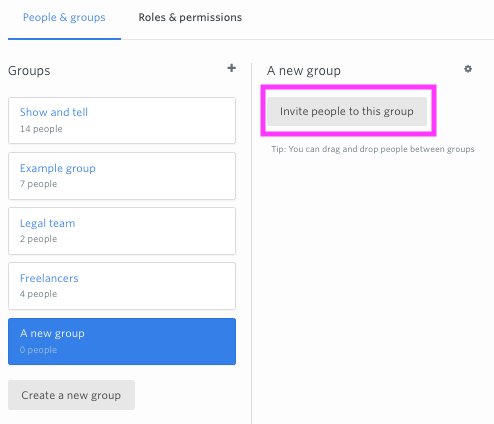 You can invite new people into your group or you can also drag and drop people from another group. You can perform various actions in bulk: assigning people to a project, updating roles, sending reset emails or deleting people. You should note that in order to delete a group you will have to delete all the people inside it first. You can select multiple people in a group by holding down Ctrl (PC) or Cmd (Mac). You can select everyone in a group by using the drop-down at the top of the list or people.